The Octagon House, also known as the Petty-Roberts House, is a historic home in Clayton, Barbour County. It was constructed between 1859 and 1861 by Benjamin Franklin Petty, a successful businessman. The Clayton house is believed to be the only surviving antebellum purely octagonal design in the southeastern United States that made use of the "gravel wall" building method, creating what is commonly referred to as a "concrete house." The building is an outstanding example of the octagon type of architecture, which was widely popular in the 1850s. It is an Alabama Historical Landmark and was added to the National Register of Historic Places in 1974. Petty, the original owner of the house, settled in Clayton in 1834 and was a prominent citizen of the town until his death in 1876. He served as a clerk of the circuit court, store owner, and a manufacturer of fine carriages and furniture. A staunch member of the Methodist Church, Petty was married a total of three times, being twice widowed after his first two wives died as a result of complications from childbirth. He fathered 17 children, but only four outlived their parents. Two of his sons died as a result of service in the Confederate Army and five of his children died in infancy or early childhood. To meet the needs of his large family, Petty continually sought ways to expand or improve his residence. In the 1850s, Petty made several trips to his home state of New York to purchase goods for his store in Clayton and visit his mother, who lived on Long Island. While in New York, Petty visited an unusual octagon home that was constructed with gravel walls. 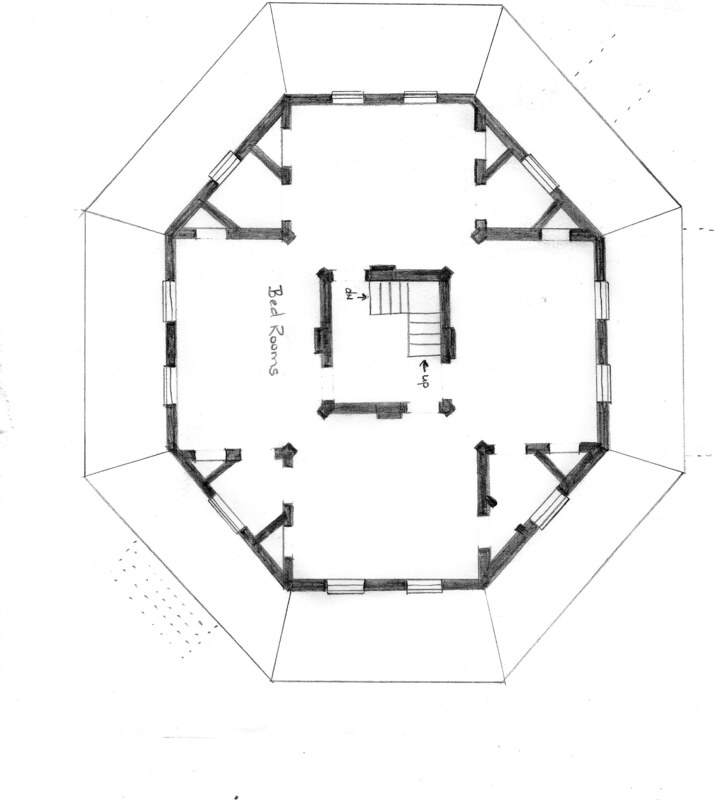 Petty liked the octagon design and returned with floor plans for a future new house. When Petty's frame home was destroyed by fire in 1858, he decided to construct his new residence according to those plans, with the fireproof aspect of the "gravel wall" construction influencing his decision. 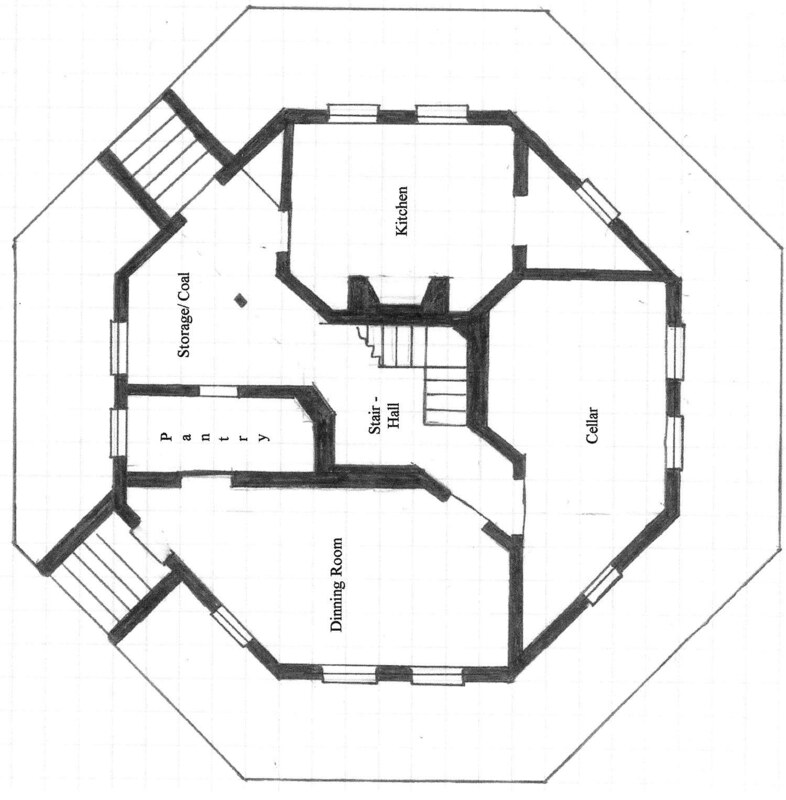 The octagon design that Petty's builders used is described in Orson S. Fowler's A Home for All, or the Gravel Wall and Octagon Mode of Building. Fowler was a staunch advocate of the octagon house, and his book was a catalyst for an octagon architectural fad in the United States. 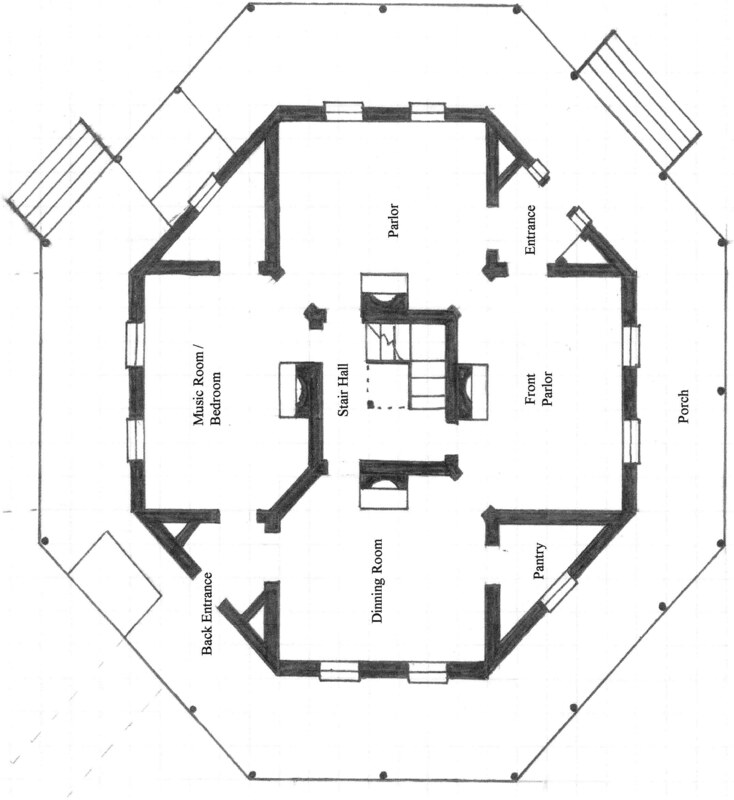 According to Fowler, the floor plan used for the Clayton Octagon was "a superior plan" for a large home because the design provided maximum use of space, good ventilation, and easy heating and cooling. During the Civil War, the Octagon House served as the headquarters of Union Brevet Major General Benjamin H. Grierson, whose troops occupied Clayton on April 28, 1865. Petty offered his home to the general in hopes that it would not be looted or destroyed by the invading army. The occupying Union troops commented that the structure looked like a fort with windows. Following the war, Petty and his wife continued to live in the house until their deaths. The Clayton Octagon House has massive, 17-inch-thick walls, with each "face" of the octagon being 18 feet long. To create such sturdy walls, builders constructed a wooden frame made of horizontal boards and filled it with a mixture called grout made of sand, gravel, and water that hardened like cement. The wet grout was poured in sections about 18 inches deep and allowed to set up for at least 24 hours before the next section was constructed. After a section hardened, the builders removed the frame, reconstructed it on top of the old section, and poured the next section until the wall reached the desired height. The finished walls were plastered inside and out, and the exterior walls were scored to look like stone blocks. The home consists of three floors and a cupola. The main two floors have four large six-sided rooms that surround the square central stairwell hall. Small wedge-shaped rooms separate each of the larger rooms. The house has four chimneys that extend upward from the basement through the center of the structure to the cupola, which features four large windows and is formed in part by the chimneys. The entire structure resembles a wagon wheel, with the cupola serving as the hub and the inside walls serving as the spokes of the wheel—an appropriate shape for a manufacturer of carriages. On the main two floors, interior doors were placed so that a person could move from room to room in a complete circle around the stairwell in the center. The stairwell and cupola were functional in addition to being decorative. When the windows were open, the design created a natural updraft from the basement to the cupola, causing air to circulate freely through all the rooms of the house. The basement was excavated three feet below ground level to take advantage of natural cooling. It has five rooms and a combination stairwell-hall. The winter kitchen includes a large fireplace used for cooking and a small room for storage. The heat from the kitchen helped keep the upstairs rooms at a comfortable temperature in winter. In summer, cooking was done in a separate building behind the house. The work room, which was also used as a dining room, includes a large pantry and is the only full-sized room in the house with its own outside door. Both the kitchen and the work room have brick floors. The stairwell hall has a stone floor, includes an area for fuel storage, and functions as the work entrance to the basement. A large dirt-floored cellar completes the basement plan. The first floor has front and back entrances located in two of the small wedge-shaped rooms. The west and south parlors are located on each side of the front entrance. The dining room and the music room, which was sometimes used as a bedroom, are located on either side of the back entrance. The dining room also includes a butler's pantry. The small room off the music room has served as a bedroom, dressing room, bathroom, and storage area. The four large rooms on this floor all have coal fireplaces. Three of the large rooms downstairs originally had two closets each. The second floor is arranged like the first, except that the corners in the wedge-shaped rooms were used to create eight small triangular closets, accessible from the four large bedrooms. This layout resulted in four small five-sided rooms originally used as dressing rooms, small bedrooms, and a play room. The four large bedrooms were fitted with small coal-burning heaters in winter time. In 1899, the Octagon House passed to Petty's daughter Nannie and her husband, C. S. Herlong. The young couple did not need a large house, but neighbor Judge Bob T. Roberts, who had a large family, did. In January 1901, Roberts offered a "trade plus cash" deal to the Herlongs in which he swapped his house, now called the Herlong-Warr House, for the Octagon House and paid the couple the difference in the value of the two homes. Roberts's wife Claudia, a mystery writer, used the abandoned basement for the setting of one of her most successful short stories "The Rusty Key." When the Roberts's daughter Mary married William C. Beaty in the mid-1920s, the second floor was made into a separate apartment for the couple. The Beatys inherited the house from Roberts and drastically modified the structure, building a two-story addition at the back entrance that included kitchens and bathrooms. The one-story porch on the front was replaced by a much larger two-story porch. A new outside stairway was constructed, and windows on both the first and second floor were converted to entrance doors. The original entrance hall was used as an office, and the door was replaced by a window. The inside stairs between the first and second floors were removed, and the area became a closet. William Beaty died in 1958, and in 1971 Mary married Elliot Armistead, a descendant of one of the founders of the city of Montgomery; after Mary's death in1973, Armistead lived in the Octagon House until his death. During the later years of his life, Armistead rented the second-floor apartment to Oats Caraway, a native of Clayton and history enthusiast who conducted the research necessary to earn the home a place on the National Register of Historic Places. The 1981, the town of Clayton, through the efforts of then-Mayor Ed Ventress, purchased the Octagon House from the estate of Mary Roberts Beaty Armistead and set up the Clayton Historic Preservation Authority to facilitate its restoration and preservation. The commission oversaw efforts to restore, repaint, and furnish the house to its original appearance, with gray walls and forest green trim. The structure was restored to its pre-1920s appearance and today has 12 large rooms, 10 small rooms, 10 closets, 37 windows, four outside doors, and 31 inside doors. The home now serves as an event facility operated by the town of Clayton. Jeane, D. Gregory, and Douglas Clare Purcell. The Architectural Legacy of the Lower Chattahoochee Valley in Alabama and Georgia. Tuscaloosa: University of Alabama Press, 1978. Fowler, Orson S. The Octagon House: A Home for All. New York: Dover Publications, Inc., 1973. Heritage of Barbour County, Alabama. Clanton, Ala.: Heritage Publishing Consultants, Inc., 2001. Hightower, D. L. To Remember a Vanishing World: D. L. Hightower's Photographs of Barbour County, Alabama, c. 1930-1965. Eufaula, Ala.: Historic Chattahoochee Commission, 1997.